Effective multicultural education must consider not just schooling, but also the larger social, economic, and political factors that affect students’ success or failure in the classroom. Affirming Diversity: The Sociopolitical Context of Multicultural Education helps readers understand these pervasive influences by presenting extensive research and data on the sociopolitical nature of schools and society, information about different sociocultural groups, and a conceptual framework for examining multicultural education. Real-life cases and teaching stories dominate in this book that offers a first-hand look into the lives of students and educators from a variety of backgrounds. Additionally, tips for classroom activities and community actions offer aspiring teachers concrete suggestions to provide high-quality, inclusive education in spite of obstacles they may face. Throughout the 7th Edition, Nieto and Bode consider current policy, practice, and legislation issues while they outline a model of multicultural education that affirms diversity, encourages critical thinking, and leads to social justice and action. 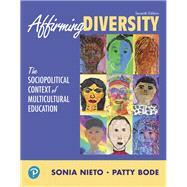 Sonia Nieto has dedicated her professional life to issues of diversity, equity, and social justice. With experience teaching students at all levels from elementary grades through graduate school, currently she is Professor Emerita of Language, Literacy, and Culture, University of Massachusetts, Amherst. The author of 11 books and numerous journal articles and book chapters, she is the recipient of many awards for her research, advocacy, and activism, including the Multicultural Educator of the Year Award from the National Association for Multicultural Education, and the Social Justice in Education Award from the American Educational Research Association. She is also the recipient of eight honorary doctorates. Patty Bode combines nearly twenty years in PK-12 classrooms, and a decade in higher education, to inform social justice perspectives in her current work as the principal of Amherst-Pelham Regional Middle School in Massachusetts Public Schools. Patty’s research, teacher leadership and community collaboration focuses on imaginative school structuring and curriculum reinvention. She has received awards for efforts in antiracist and anti-bias curriculum reform and bridging theory and practice in multicultural education, including the 2017 Art Educator of the Year for Supervision and Administration of the Eastern Region by the National Art Education Association, the 2016 Women's Caucus Carrie Nordlund Award in PK-12 Feminist Pedagogy, also from NAEA, and 2005 Multicultural Educator of the Year Award from the National Association for Multicultural Education.